Every once in a while for breakfast you want something different than the usual bowl of cereal or some friend eggs and toast; something that makes breakfast seem like a little more of a treat. 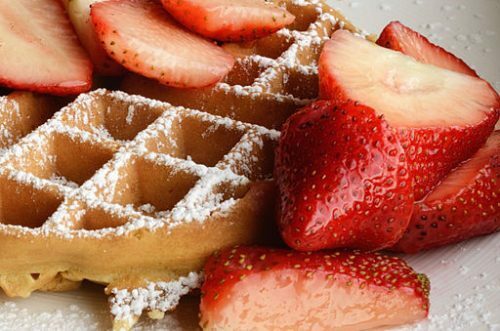 If you are like most people when you get this type of craving you choose waffles but not just any waffle; you want a Belgian waffle that is crispy on the outside and is light and fluffy on the inside. They taste so good it makes you wonder how they come out so perfect? Well here is how the right combination of Belgian waffle batter and a specially designed Belgian waffle maker produce those same mouthwatering waffles every time you go to make them. Classic waffle batter contains a large amount of baking soda in it. This makes them bake more like a cookie than a piece of bread. This is why classic waffles are not only crispy on the outside but well-cooked and crispy all the way through. They are not only much firmer than Belgian waffles on the inside but they are much smaller also. That means they do not hold toppings nearly as well as much larger and deeper-pocketed Belgian waffles do. What makes Belgian waffle batter cook up crispy on the outside yet stay softer on the inside? This is accomplished in one of two ways. The first way is the traditional way these waffles were originally made in Europe and that is done by adding yeast to the mix. Over the years bakers have learned to experiment and found that beating egg whites thoroughly and adding them to the mix would make a similar type Belgian waffle without as much prep time. Belgian waffle batter is much different in many ways than classic waffle batter because it stays softer in the middle because of its lower baking soda content (classic waffles use 4 – 5 teaspoons of baking soda). It expands as it bakes like bread and does not crystallize all the way through to the center like a cookie or classic waffle does when baked. One other nice feature of Belgian waffle makers is they will allow you to use many different types of batter in them. Batter flavors such as chocolate chip, sourdough and pumpkin are a few examples of favorite style batters that people use in their Belgian waffle maker. It does not matter what type of ingredients you put in a Belgian waffle maker or how delicious that batter is if you don’t have the proper equipment to make Belgian waffles. That is why you will need to have a good Belgian waffle maker of your own. You can find a Belgian waffle maker that will do the job nicely priced anywhere from $20 – $280 dollars. It all depends on how often you like having Belgian style waffles and exactly how discerning your taste buds are when eating them. Most high-end Belgian waffle makers will come with several different browning settings. Some have as many as 7 or 8 different browning settings. These are perfect for someone who knows exactly how they like the crispiness on the outside of their Belgian waffles. Once you find the setting you like you simply leave it there and you will be producing identically cooked Belgian waffles each and every time. One thing people love about Belgian waffles is the large amount of toppings these waffles hold. Did you ever wonder how those channels are made? It has to do with the shape of the baking grid. Belgian waffles have deep baking grids that can make a waffle as thick as 1 ½ inches. That means you have a lot of space for toppings on each and every Belgian waffle you make. One of the secrets to making good Belgian waffles is to get every bit of the baking grid completely full of batter. When you do this it’s inevitable that some of that batter will spill onto the waffle maker. Waffle batter is extremely difficult to clean off after it dries. That is why the best Belgian waffle makers have a built-in overspill channel to catch the excess batter when poured so cleanup is easy. We mentioned that in order to get Belgian waffles to turn out great you need to completely coat every inch of the baking grids with batter. One of the best ways to do this is with a Belgian waffle maker that has a flip-top feature. The batter spreads completely over the entire baking surface when the handle is flipped and produces fully baked and 100% complete waffles every time. Indicator lights on Belgian waffle makers take the guesswork out of the waffle baking process. The best models will have three sets of indicator lights. One to let you know the power is on, another to let you know your Belgian waffle maker is properly preheated and yet another to let you know your Belgian waffle is ready and cooked just the way you like it. So there you have it. Now you know how to get those Belgian waffles you like to come out perfect every time. All it takes is the right waffle batter and a quality Belgian waffle maker.